How Common Are Eating Disorders and Substance Use Disorders? How Are Substance Abuse and Eating Disorders Related? 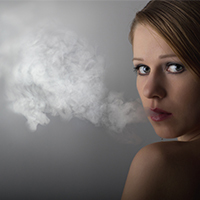 Eating disorders and substance abuse have a unique association with each other. Coping with one of these issues increases the chances that a person may have to cope with the other, at some point in time, and there are a number of factors that contribute to the interplay between both disorders. 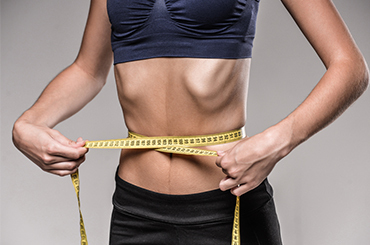 Anorexia Nervosa – Can result in severe weight loss secondary to distorted body image, intense fear of gaining weight and resultant pathological dieting or food restriction. Anorexia has a lifetime prevalence of 0.9% in women and 0.3% in men. Bulimia Nervosa – Frequent excessive eating (known as a food binge) followed by inappropriate purging (such as self-induced vomiting, abuse of laxatives and/or excessive exercising) to avoid weight gain. Bulimia has a lifetime prevalence of 1.5% for women and 0.5% for men. Binge Eating Disorder – Recurrent episodes of compulsively eating very large amounts of food with a sense of loss of control. Binge Eating Disorder has a lifetime prevalence of 3.5% among women and 2% among men. For some people, substance abuse led them into an eating disorder. For others, their eating disorder gave way to substance abuse. No matter which disorder arose first, there is no denying the dangers of both. If you are concerned about either of these struggles in yourself or a loved one, don’t hesitate to call 1-888-993-3112Who Answers? to speak with a treatment support representative about finding help. It is not uncommon for a person with an eating disorder to also suffer from a substance abuse problem. In 2014, Substance Use Disorder affected 21.5 million people, or 8.1% of the U.S. population. Of these people, nearly 40% also struggled with a mental disorder. The association between eating disorders and substance use disorders has been widely documented, especially among adolescents. Research has found that up to 50% of people diagnosed with an eating disorder will struggle with substance abuse, whereas only 9% of the general population is diagnosed with a substance use disorder. Conversely, 35% of substance abusers have been found to also have an eating disorder, compared to the 3% of the general population diagnosed with an eating disorder. This means that a person with an eating disorder is five times more likely to abuse drugs or alcohol than a person without an eating disorder, and a person with a substance abuse problem is 11 times more likely to have an eating disorder. The phenomenon is the topic of much ongoing study. To date, there may not be a definitive answer to the question of why eating disorders and substance abuse are related, but there are many research-supported theories. Does substance abuse cause eating disorders? Many drugs affect appetite – some, including marijuana and other cannabinoids, result in a subjective increase in appetite and subsequent eating behavior. Others, including stimulants such as cocaine and methamphetamine, reduce an individual’s drive to eat. Persistent changes in appetite and eating behavior – even when mediated by substance use – can prime an individual to develop chronically disordered eating patterns, and ultimately lead to an eating disorder diagnosis. Stimulants and cannabis (marijuana) seem to be the substances most closely related to eating disorders. Marijuana increases appetite and thus may be implicated in some instances of binge eating. On the other end of the spectrum, those drugs that reduce appetite – including Ritalin (methylphenidate), Adderall (amphetamine), methamphetamine, cocaine and ecstasy – are all potentially related to disordered eating behaviors that involve restricted food intake, such as anorexia. Alcohol is another drug that is related to eating disorders – specifically bulimia – though this association may mediated by the effects of other psychological disorders or personality traits. For example, impulsivity – specifically, reward sensitivity or drive – has been linked to both eating disorders and substance use. Both food and drugs stimulate the brain’s reward circuitry; the way this reward mechanism is influenced, either by aspects of personality (like impulsivity) or psychological disorders, is critical to the correlation between substance use and eating disorders. All told, abusing any of these substances (or combination thereof) can cause a major change in diet and caloric intake, which may give rise to or hasten the development of an eating disorder. Another theory regarding the association between eating disorders and substance abuse is that eating disorders may lead to substance abuse problems. Someone already struggling with an eating disorder may cause a person to begin using stimulants for their appetite-suppressing effects. When a person desperately wants to lose weight they may seek out appetite reducing substances that will further facilitate their caloric restricting behavior. Another way that an eating disorder may give rise to substance abuse is that food deprivation may affect the brain’s reward system pathways, making a person more likely to abuse substances that provide a rush of the brain’s reward chemicals. Whether substance abuse initiates the development of an eating disorder or, conversely, eating disorders give rise to substance abuse behavior is still being debated—the directionality likely varies given differing individual circumstances. When an eating disorder and a substance abuse problem occur together, they can serve to exacerbate the risks and dangers associated with each one individually. A person suffering from these disorders would be best served to find treatment that will address both issues, not just one or the other. Please call 1-888-993-3112Who Answers? and get treatment today. Novelty-seeking – A person seeks out new experiences often. Impulsivity – A person makes spur-of-the-moment decisions and choices. High interpersonal sensitivity – A person is very good at perceiving others’ feelings and motivations. Neuroticism – A person has high levels of negative mood, such as depression, anxiety, and low self-esteem. Poor emotion regulation – A person may have maladaptive reactions to their emotional feelings. Each of these personality traits has been associated with both eating disorders and substance abuse problems. Specific features of this personality profile may render a person more susceptible to emotional and societal pressures, potentially turning them towards the use of substances and strict food control to cope. In addition to these personality traits, suffering from depression and experiencing life trauma have also been associated with both eating disorders and substance abuse. The effects of substance abuse and eating disorders may interact with each other in ways that reinforce or worsen each issue. Both substance abuse and eating disorders can cause feelings of guilt in a person—those suffering from an eating disorder may use substances as an attempt at self-medication to manage feelings of anxiety or depression. In addition, bulimia has been found to have a stronger association with substance abuse than anorexia, perhaps due to the binging habits of people suffering from bulimia. Because people with anorexia use restrictive eating behavior, they may not be as willing to ingest other substances. Center for Behavioral Health Statistics and Quality. (2015). Behavioral health trends in the United States: Results from the 2014 National Survey on Drug Use and Health (HHS Publication No. SMA 15-4927, NSDUH Series H-50). Krahn, D. (1991). The relationship of eating disorders and substance abuse. Journal of Substance Abuse, 3(2). 239-253.
of the literature. International Journal of Eating Disorders, 16(1). 1–34. Courbasson, C. M., Mclaughlin, P. M., Letchumanan, M., & Wong, B. I. (2010). Substance use disorders in adolescents with eating disorders. Minerva Psichiatrica, 51(3). 177–189. Harrop, E. N. & Marlatt, G. A. (2010). The comorbidity of substance use disorders and eating disorders in women: Prevalence, etiology, and treatment. Addictive Behaviors, 35(5): 392–398. Denoth F, Siciliano V, Iozzo P, Fortunato L, & Molinaro S. (2011). The association between overweight and illegal drug consumption in adolescents: is there an underlying influence of the sociocultural environment? Plos One, 6(11). 1–8. National Center on Addiction and Substance Abuse at Columbia University (CASA): Food for thought: substance abuse and eating disorders. 2003. Nokleby, H. (2012). Comorbid drug use disorders and eating disorders – a review of prevalence studies. Nordic Studies on Alcohol and Drugs, 3(29). 303-313. Rodondi, N., Pletcher, M. J., Liu, K.
, Hulley, S. B., & Sidney, S. (2006). Marijuana use, diet, Body Mass Index, and cardiovascular risk factors. American Journal of Cardiology, 98(4). 478–484. Piran, N. & Robinson, S. R. (2006). Associations between disordered eating behaviors and licit and illicit substance use and abuse in a university sample. Addictive Behaviors, 31(10). 1761–1775. Cochrane, C., Malcolm, R., & Brewerton, T. (1998). The role of weight control as a motivation for cocaine abuse. Addictive Behaviors, 23(2). 201–207. Curran, H.V. & Robjant, K. (2006). Eating attitudes, weight concerns and beliefs about drug effects in women who use ecstasy. Journal of Psychopharmacology, 20(3). 425–431. Neale, A., Abraham, S., & Russell, J. (2009). ”Ice” use and eating disorders: A report of three cases. International Journal of Eating Disorders, 42. 188–191. Dansky, B. S., Brewerton, T. D., & Kilpatrick, D. G. (2000). Comorbidity of bulimia nervosa and alcohol use disorders: results from the National Women's Study. International Journal of Eating Disorders, 27. 180–190. Hudson, J. I., Weiss, R. D., Pope Jr, H. G.
, McElroy, S. K., & Mirin, S. M. (1992). Eating disorders in hospitalized substance abusers. American Journal of Drug and Alcohol Abuse, 18 (1). 75–85. Newman, M. M. & Gold, M. S. (1992). Preliminary findings of patterns of substance abuse in eating disorder patients. American Journal of Drug & Alcohol Abuse, 18(2). 207–211. Grilo, C. M., Sinha, R., & O'Malley, S. S. (2002). Research update: Eating disorders and alcohol use disorders. Alcohol Research and Health, 26. 151-160. Calero-Elvira, A., Krug, I., Davis, K., Lopez, C., Fernandez-Aranda, F., & Treasure, J. (2009). Meta-analysis on drugs in people with eating disorders. European Eating Disorders Review, 17(4). 243–259. Thompson-Brenner, H. K., Eddy, T., Franko, D. L., Dorer, D., Vashchenko, M., & Herzog, D. B. (2008). Personality pathology and substance abuse in eating disorders: A longitudinal study. International Journal of Eating Disorders, 41. 203–208. Lacey J. H. (1993). Self-damaging and addictive behaviour in bulimia nervosa: A catchment area study. British Journal of Psychiatry, 163. 190–194. Carbaugh, R. J. & Sias, S. M. (2010). Comorbidity of bulimia nervosa and substance abuse: Etiologies, treatment issues, and treatment approaches. Journal of Mental Health Counseling, 32(2). 125–138. use disorders: Common genetic and environmental influences. International Journal of Eating Disorders, 40. 673–678. Root, T. L., Pisetsky, E. M., Thornton, L., Lichtenstein, P., Pedersen, N. L., & Bulik, C. M. (2010). Patterns of co-morbidity of eating disorders and substance abuse in Swedish females. Psychological Medicine, 40. 105–115. Blinder, B. J., Cumella, E. J., & Sanathara, V. A. (2006). Psychiatric comorbidity of female inpatients with eating disorders. Psychosomatic Medicine, 68. 454–462. Herzog, D. B., Franko, D. L., Dorer, D. J., Keel, P. K., Jackson, S., & Manzo, M. P. (2006). 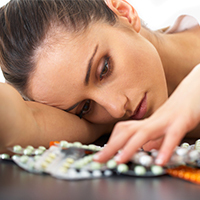 Drug abuse in women with eating disorders. International Journal of Eating Disorders, 39(5). 364–368. Dohm, F. A., Striegel-Moore, R. H., Wilfley, D. E., Pike, K. M., Hook, J., & Fairburn, C. G. (2002). Self-harm and substance use in a community sample of black and white women with binge eating disorder or bulimia nervosa. International Journal of Eating Disorders, 32(4). 389–400. Flood, M. (1989). Addictive eating disorders. Nursing Interventions for Addicted Patients, 24. 45-53. Zweben, J. E. (1987). Eating disorders and substance abuse. Journal of Psychoactive Drugs, 19. 181-192.